If you are into Splunk rules development, I am pretty sure this post will relate to you. But before entering the main topic, let me quickly define what a SIEM use case is about, which is another trendy, hot topic in the Infosec industry today. 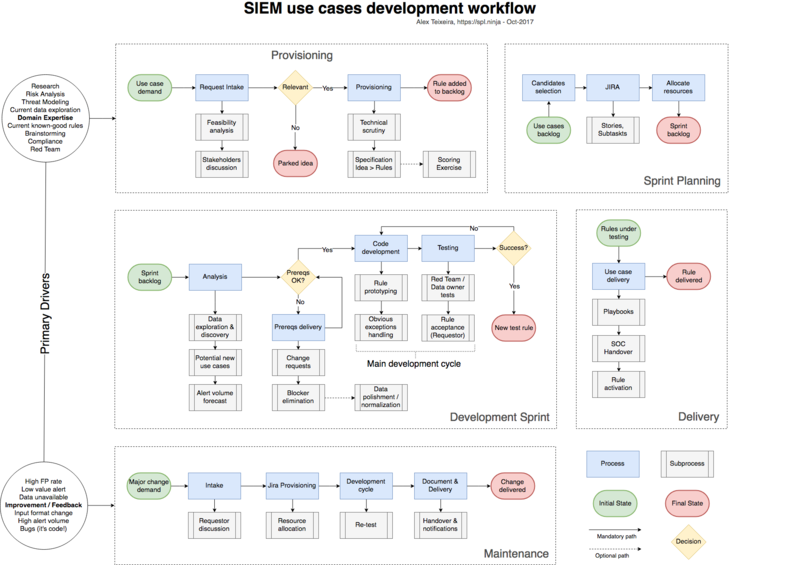 What is a SIEM use case after all? In the end of the day, you may have the best, 100% available architecture, ingesting all sorts of logs; but if the platform does not provide value, you fail. That’s all. And don’t fool yourself, Compliance/Regulation or Forensics use cases are out of this scope. If your use case is storing logs for later usage, it’s better revising the plan. You likely don’t need Splunk to simply store data and eventually search over it. For that, you rely on on log management solutions which are not only cheaper, but easier to use and ultimately, avoiding wrong expectations (threat detection capability). Despite being a bit reluctant in the beginning, the path to adopt the Agile methodology for developing security use cases with Splunk came in naturally. It comes as no surprise for those who already treat Splunk queries as code, and it is particularly applicable for customers who want to embrace custom development. In this article, I am going to highlight some of the benefits around that and also propose a workflow for the ones willing to give it a try. It’s a set of principles for software development under which requirements and solutions evolve through the collaborative effort […] It advocates adaptive planning, evolutionary development, early delivery, and continuous improvement. I’m not here to prove Agile is -the- solution for you nor am I saying you should become a Scrum master or anything like that. But I encourage you to get familiar with the concepts, to go deeper on a particular topic that interests you, try and experiment. There’s absolutely no need to blindly follow or enforce anything, but to leverage what best suits your development practice. Nevertheless, some still see that as another heavy process to bring in or something that will put more overhead on developers – which is not true. Agile processes are designed to work and evolve over time, getting tighter and faster. Transparency, Transparency, Transparency. Some ideas are super cool and sometimes they seem pretty easy as well. Turns out you still need time and resources to make it happen. Following a methodology allows those otherwise blurry requirements to emerge. That’s essential for better planning. The transparency gives you and your team the ability to better handle expectations from stakeholders and management. For instance, to deliver a certain use case, you first need the right data on-boarded. To deliver more rules per development cycle, you need to enable more coders. Easier prioritization. When there’s something actively blocking progress, it’s easy to link blockers/goals together and quickly evaluate the ‘cost’ of an unresolved issue, rapidly realizing the missing value of not tackling certain issues first. Visibility and versatility. The concept of ‘Sprints’ provides the highest impact giving your capabilities (engineering). It’s easier to increase the pace and throughput as well a adapt, once it’s done in small, incremental targets. Better collaboration with easier project tracking. That’s especially needed when working with ‘virtual’ teams located in different timezones. Instead of a big team working together, one or two members working on small tasks. The list goes on and on but those should give you a hint on what’s possible to achieve. I would call this a draft as you will need to adjust to your own practice or organization giving that many of those boxes can be broke down into multiple sub-processes. It’s more applicable to rules development (correlation searches) but may be easily adapted for managing more elaborated, long-term use cases. It’s made with Draw.io which works pretty well (contact me for the XML/VSD version). Security Analytics: How to rank use cases based on the “Quick Wins” approach? Feel free to reach out in case you have comments/feedback.